The grill is endowed with durable components and versatile features fit for outdoor use. It comes with side tables attached to both sides for ease of space and storage of food items. A greasy tray is available to prevent spillage of drippings and mess during clean-up. It contains the InstaStart electronic ignition and a 16.4 ounce disposable propane cylinder. It can operate and accommodate a couple of hours of grilling and cooking however it can reach up to four hours when the settings are set to low. On the other hand, this grill is very safe to use since a heavy-duty vitreous lid contains flames to minimize any danger and at the same time blocking access to any insects or debris. This griller comes with a limited five-year warranty upon purchase. 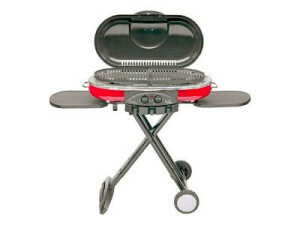 The Coleman 9949-750 Road Trip Grill LXE requires assembly which is very easy to do. Its portable design makes it easier for travelers to transport and handle. Although it is portable and compact in design, it has ample space to do all the cooking and grilling jobs. It can handle several pieces of meat. The two side tables really serve their purpose in food preparation and storage. The whole grill is also very durable and sturdy. There is nothing to fear of wobbling while cooking. Its versatile features, just like the InstaStart, allow lighting of burners quite easy. You can also expect even and fast cooking of food whether the meals are for breakfast, lunch, or dinner. It heats up quickly and after use, it cools down quite fast too. It is also very easy to clean and a great value for money since it uses small propane tanks which are economical. The grill is crafted with metal which is heavy in terms of weight. Other than that it is also very bulky which is quite inconvenient for transport and storage. When doing the grilling job, you cannot do it without having the top down. There are some difficulties encountered upon cleaning the whole thing due to its design. The heat distribution between the two burners was found to be uneven resulting to uneven cooking of food. In setting the temperature, even if the set-up is low, it is still very hot unable to observe slow cooking. There were instances also when the newly purchased unit was assembled and tried to do a start-up and failed to do so.